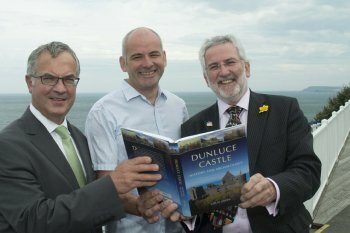 A new book on Dunluce Castle’s intriguing and colourful history by Ulster marine archaeologist Dr Colin Breen, was launched this week by Environment Minister Alex Attwood. ‘Dunluce Castle: History and Archaeology’ provides a comprehensive study of the castle, the buried archaeological remains at Dunluce and the historical background to the site and its surrounding area. The castle’s majestic cliff top location on the north Antrim coast has made Dunluce one of Northern Ireland’s most visited and iconic monuments. For the past four summers Dr Breen has led excavations on the site, unearthing a real treasure trove of historical artefactes to help unlock the secrets of the Castle and its environs. With local community and school groups all playing a key role in the annual archaeological digs, Dr Breen says the Dunluce project highlights the relevance and application of academic research. He explains how amateur archaeologists worked side by side Northern Ireland Environment Agency staff and QUB archaeology students to help to uncover previously unidentified remnants of a significant settlement in the fields beyond Dunluce. While there is evidence of settlement at Dunluce since the early medieval period, Dunluce Castle itself was built at the end of the fifteenth century by the MacQuillans and later occupied by the MacDonnells who embarked on an extensive programme of rebuilding and renovation. The nearby town was established just beyond the castle gates at the start of the Plantation of Ulster in 1607/8 by Randal McDonald. Over the next few decades, its population grew to around 1000. Although it was settled exclusively by merchants from Scotland, archaeological evidence points to strong English, France and Spanish influences. Dr Breen adds that Dunluce was a very cosmopolitan quite well to do settlement, judging from the quality ofartefactesuncovered which ranged from bone combs, dress fastenings, decorated thimbles, buckles to pieces from 17th century board games. However, following an uprising in 1641, the houses were burnt down and the settlement abandoned. Over time, the buildings collapsed and their remnants were covered with sand and overgrown with grass, leaving the foundations and whatever was left in the buildings almost perfectly preserved. Dr Breen continues: “Unusually for a site this size in Ireland – it was approximately 20 acres – the land was never farmed, so the deserted town of Dunluce has lain undisturbed for centuries. “So far we’ve only excavated around 5 per cent of the site but already we can see the layout of the abandoned town. The artefactes uncovered, such as well decorated pottery, help us interpret the strong links with other cultures and to build up a detailed picture of what life was like for people living there in the first half of the 17th century." The Coleraine based academic hopes that the annual archaeological dig at Dunluce will become a permanent feature and the first stage of a major new tourism imitative to have a ‘learning hub’ and visitors’ centre at Dunluce. He says the development could have the potential to make a significant contribution to the North’s economy. “To date, hundreds of people from all Northern Ireland have visited Dunluce to take part in the archaeological dig at the site. They all feed offthe enthusiasm of other volunteers and it’s a wonderful interactive experience for them. “The project has already given us a lot of really good primary data and, for the first time, scientific basis for building up a detailed picture of the past which has direct relevance for contemporary society. Conserving human heritage and strengthening Northern Ireland’s tourism product are among the key present day results of the work so far,” he explains. The lands surrounding Dunluce Castle were purchased by the Northern Ireland Environment Agency earlier this year. Speaking at the launch, Mr Atwood said it was the first stage of an ambitious, exciting and engaging project of excavation, interpretation and conservation of the Dunluce Castle and the ‘lost town of Dunluce’. “Not so many years from now, our own little Pompeii could be revealed for all to see and marvel.